We are a leading service provider for the Diamond Grading. 1. The diamond, unlike the other gemstones, has an internationally acclaimed grading system which gives the appropriate value to itself. Pricing is done in accordance to the grading system and that’s why not all diamonds have the same value. 3. The Diamond Grading course also throws light upon the treatments done on diamonds and how diamonds are synthetically produced and briefly guide the cutting and faceting methods of diamond. 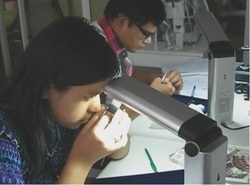 Looking for Diamond Grading Courses ?